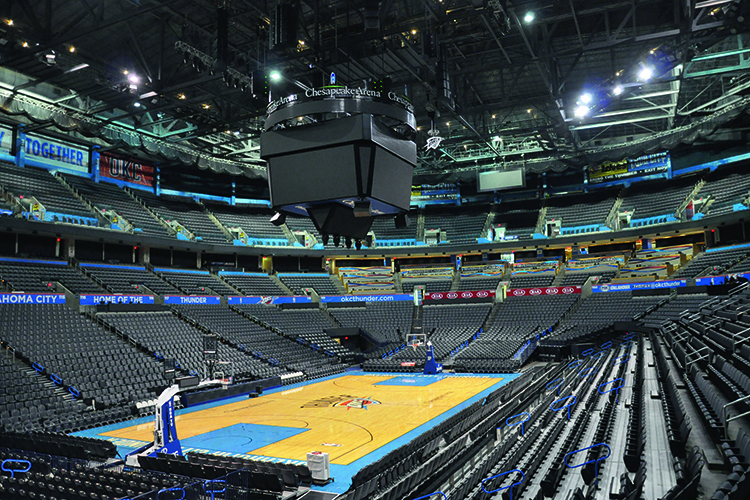 The project was to update the main bowl audio system at Chesapeake Energy Arena. This consisted of removing all of the existing distributed sound system, including all the speaker cabinets and associated power amplifiers. We specified four straight-hanging EAW Anya arrays above the scoreboard, while the north and south ends are given exceptional coverage using arrays made up of two columns of six Anya modules. For the east and west areas, a pair of four-high, two-wide column Anya arrays are used, which, when all together, deliver 360° coverage for the whole arena. In addition to the EAW Anya system, Jerrold also used four subwoofer arrays hung above the four corners of the scoreboard, which were made up of six Fulcrum Acoustic CS121 subwoofers. Also, mounted on the bottom of the scoreboard are four Renkus-Heinz STX7/94 loudspeakers to provide additional coverage for the first three rows of courtside seats, as well as serving as monitor loudspeakers for halftime and timeout entertainment. Cardioid was a huge factor in the arena design. Vertical subwoofer arrays are ideal for providing smooth coverage to the seating bowl and keeping sound energy off the floor. However, the large centrally located scoreboard precluded any loudspeakers directly over centre court. Forced to hang subwoofer arrays around the scoreboard’s perimeter, I knew cardioid patterns were necessary to minimise interference between arrays. For the amplification, QSC amplifiers are used for the existing audio equipment in the concourse, along with the other audio systems outside of the bowl. For the newly-installed loudspeakers, Lab.gruppen amplifiers were utilised, with three FP 14000 Series amplifiers for the Fulcrum Acoustic subwoofers and eight FP 10000Q Series amplifiers for the Renkus-Heinz equipment. The EAW Anya system is different, as they’re self-powered with dedicated Powersoft amplification already built in. The mixing equipment adds another layer of flexibility, too, with Jerrold specifying a Yamaha CL3 mixing console that is within a road case for simple transport. A Yamaha Rio 3224-D Dante I/O box helps in terms of transport to and from the new mixing console via Dante, while two additional Yamaha Rio 1608-D boxes in portable road cases provide inputs and outputs at any location with access to the Dante network. Overall, the entire audio system runs on the Dante platform, which provides control and signal routing between the mixing system, existing DSP and the Anya arrays via standard Ethernet. 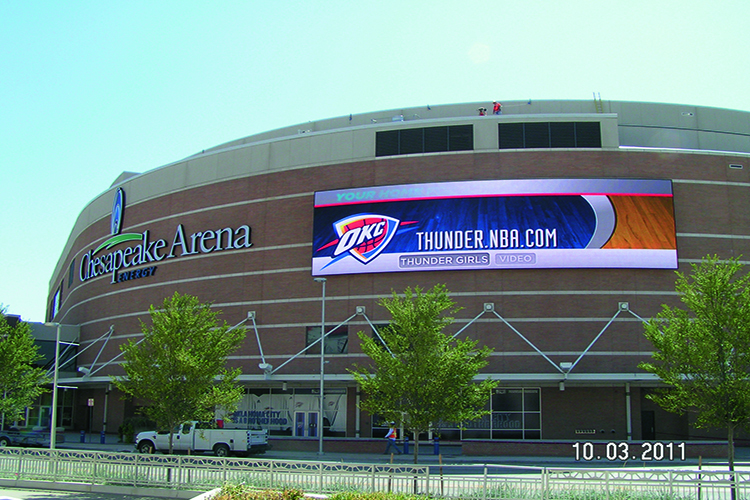 Inside the Chesapeake Energy Arena, you’ll find four displays for the primary video centrehung, as well as another four for the auxiliary video centrehung. There is also another four Daktronics displays for the centrehung tapered displays corners. Another two are used for the centrehung bottom displays, too, as well as the centrehung top ring. There is an end wall auxiliary display and ribbon display on the facia installed also. The end result has seen the arena become equipped with state-of-the-art video displays that are perfect for NBA games and the entertainment, as well as concerts and events. Designing an audio system for the venue that would deliver an energetic environment for NBA games, as well as vocal intelligibility and flexibility for concerts and events. The EAW Anya system delivers incredible coverage, which isn’t an easy task in a 581,000 sq ft facility. The Chesapeake Energy Arena install – from the video through to the audio – has significantly enhanced the whole experience for guests visiting the venue, whether that be for sports, music concerts or other events. 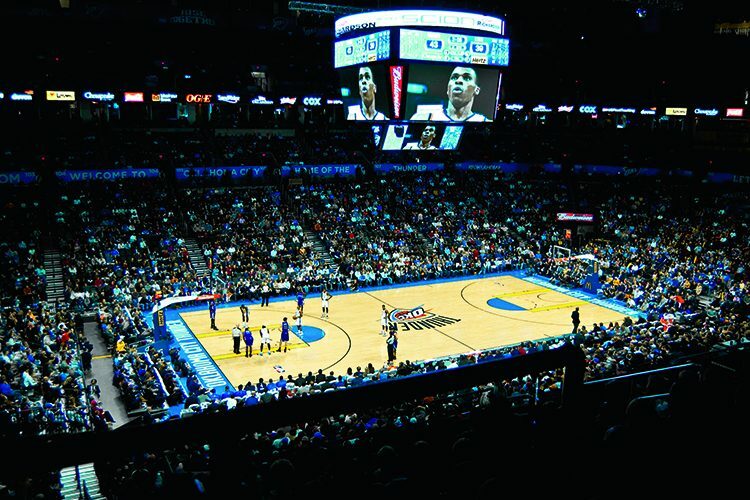 With the first EAW Anya system in place, the home of Oklahoma City Thunder can really compete with other NBA arenas in terms of atmosphere, sound coverage and entertainment, which is exactly what the aim was when the project started.